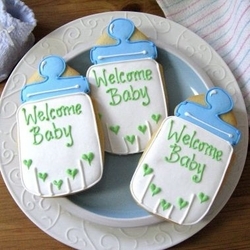 Our BABY BOTTLE Cookies are perfect for the occasion! These adorable hand decorated Baby Shower Cookies look and taste great! At a generous 5" x 2-3/4", these baby shower cookies are BIG! They will definitely impress your guests! Baby Shower cookies are a delicious and fun way to celebrate your special day. These delicious butter cookie favors are frosted with royal icing that dries to a sweet crunchy topping. These Baby Shower Cookies are sure to tickle your fancy and your taste buds. These are scrumptious classic butter cookies with just a hint of almond that makes it delicious and tender. All baby shower cookies come in cellophane and curling ribbon. Personalize your cookies with names and dates FREE! Ingredients for cookies: flour, sugar, butter, eggs, vanilla, almond extract, baking powder and salt. Ingredients for icing: Powdered sugar, meringue powder, gum Arabic, and cream of tarter. NO PRESERVATIVES!